has some faction of pop culture that i don't pay attention to - i.e. american idol, SNL, perez hilton, youtube, anything played on the radio - brought back the exclamations "yowza" and "wowza"?? i've been noticing them creeping up into conversation and correspondence with friends/acquaintances/colleagues for the past few months, but recently i've been seeing the words SO often i've decided it just has to be some new trend that i'm not privy to. so what am i missing? or is this just happening because i'm getting older, so yowza is a necessary language adjustment i have to get used to, like calling the guy next to me "sonny boy" and exclaiming "oh my heavens". raining laughing cats and dogs. but then i got into a hilarious email exchange with hillary, prompted by this. and then i saw the headline of this article. the breakfast cereal ones are my faves. and as we're just now coming out of our peep-induced sugar coma...if you did celebrate easter yesterday, a happy belated one. in what could be deemed as a slightly sadistic twist to the holiday, my grandmother opted to bring back an age-old family tradition and served rabbit - amongst a ton of other things - to celebrate. this caused major debate over dinner, and divided the family into the "i won't eat peter cottontail" - a phrase actually uttered during the course of the day - and the "screw the easter bunny! rabbit braised in red wine is just damn good" camps. loveandcyanide was of course in the latter group, and we proved victorious. hoorah. possibly the most math i've done in a decade. at the deli across the street from my parents house - where i was this morning - they don't have an actual metrocard vending machine, so they have pre-packaged cards in denominations such as $10, $20, $50. normal, round numbers. as i asked for a $10 card, the cashier laughed and said "oh, you mean the new $7 one?". i said sure, since i only needed $5 to get on the bus and into the city, and said bus was coming up the street and i didn't want to ask questions and miss it. but i thought a $7 card seemed ridiculous, especially being sold at this particular store in front of an express bus stop, since a buyer wouldn't even get a Staten Island round-trip out of it. after use, 5 cents will remain, which you can use when you refill your card. really, mta?? how helpful! thank you!! so i actually have to fill the card forty times to get enough of these bonus nickels to equal one stinkin $2 subway ride. some sisters just eat their frosted flakes. without inspection. i don't know about you guys, but i've eaten at least 1000 cereal flakes that looked like this one. little did missy and i know that we've been missing out on oodles of money-making opportunities! and while i'm on the subject of scamming, the riches starts its second season tomorrow night. its an awesome show, and we highly recommend tuning in if your Tuesday, 10pm EST time slot isn't already filled. and speaking of bacon, my favorite pig part was the theme of a most incredibly awesome and factual belated birthday present post from dear reader soulspeak23 - thank you again! - i was once part of a Staten-Island-Mall-bought best friend charm with her (it was one of those snazzy three-part ones, for all us BFF trios out there), and this was clearly a reason why. but enough of my nostalgia - just go over there and read it! and speaking of birthday present postings, i did celebrate a birthday over the weekend - a kickoff to my late 20's, filled with flowers and fun and friends and a most awesome dinner. and then an awesome dinner party. and then an awesome family dinner. and then 3 more dinners to come between this week and next. whew! at the rate i'm being fed, i may not see my thirties. its funny though, as i hadn't thought of 28 as a big deal age - then suddenly there are high school reunion talks and the realization that i'm reaching the "OMG, we've been friends for a decade. a whole decade!" point with a bunch of college friends - and i guess that 28 is some sort of milestone (even if its only really a milestone because its a milestone distance from the milestone of 18). and then i read an article on christina ricci - an actress i never liked for the sheer fact that her name is rather similar to my own - and she brought up how she believes in 7-year cycles, and that everything in life changes in these 7-year phases, and as she just turned 28 too, she was looking forward to her new fourth cycle. i found this kind of interesting as i've been dealing with a number of big changes lately, so i'm just going to attribute them to the fact that my big shiny new fourth phase is starting as well. i was now supposed to nicely tie this in to the life cycle of a scallop, but hell, they apparently can live until age 18, a number not easily divisible by 7. ah well. after seeing this, i realize that my alarm clock is only the second coolest timepiece on earth. because we adore food, and missy loves to cook, and i love to do everything involved with cooking besides the actual cooking itself, we tend to make dinner a lot more than most of our friends do. which keeps us pretty consistent with how we grew up, as our mom didn't work back then, and so we rarely ordered out, or ate the pre-made quick stuff - we actually did not own a microwave until i went off to college. no, seriously. - as there was some sort of home cooked meal on the table every single night. due to these two facts, we've missed out on the pleasure that can be found in a simplistic evening meal. like having cereal for dinner. we did it last night on a whim, and it was so super exciting. it just might have been the best bowl of cap'n crunch's crunchberries i've ever had. 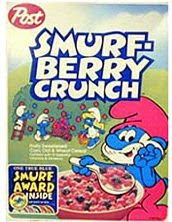 i mean, i guess it is possible the cereal was only in stores for a short period of time because my grandmother was the only person buying it...but there must have been at least one other kid out there enjoying this smurfalicious treat. i've been all wrapped up in this today, which i suppose is partly because i work in the industry, but i guess mainly because i am a reader. and as a reader, i care about a story itself, not so much about the circumstances under which the story might have been written. sure, blatantly lying to get a book published is wrong, but similar to all that james frey nonsense awhile back, i feel like all the "shocker! this isn't a memoir" hoopla isn't so much about morals as it is about saving face for the media who had previously heaped praise on a book that they thought was something it wasn't. anyways, what i find most fascinating about this particular tale of literary hoodwinking is that the author's sister ratted her out. goodness! and here missy and i thought that sometimes we tattled too much on the other. chrissy and the chamber of secrets. on each floor of our apartment building there are 2 apartments and a hall closet. when we moved in, our broker told us that the sizable hall closet was up for grabs, and whichever apt requested it first would get it, and then have it locked up. missy and i inspected the space, and while we could have easily filled it with all our miscellaneous crap, decided it wasn't worth the extra $25 a month rental fee, when we have our parents' house a mere 40 minutes away to serve as our (free) storage facility. months went by and our closet wasn't claimed (we know this because every time we were out in the hall waiting for the elevator we would give each other the "let's check the closet" look, and every time we tried the door it was unlocked, closet empty), and since it technically is on our side of the building (the hall is like 8 ft. long, so i suppose this isn't saying much) we mentally staked claim on the chamber, figuring we could use it whenever we saw fit. and then one saturday i heard all this ruckus in the hallway, and later that evening we tried the closet door, and wouldn't you know - it was locked. our neighbors had claimed it. and while i know i'm bitter about this now only because we finally realized a perfect use for it* after it was gone, i really do wonder what they need to store in there. (they don't have bikes - i know that's the obvious one) they are one couple in a good-sized two-bedroom, the same good-sized apt that two sisters and a stuffed Bear, all with shopping fetishes, manage to share. what could they possibly need an extra closet for? anyways, they were outside my door rustling around in their closet before, and i had to use all my willpower to keep from bursting into the hallway to see what their closet cache contains. i will find out someday. *perfect use: as a photo booth during our parties. (ok, so, fine. we don't have authentic photo booth equipment. but stick a polaroid, a stool, and some drunk people in there and a good time was guaranteed). we have also, for years, have been so desperately wanting to host a real world party**, and the closet would have made for a marvelous confessional. damn you, apt 5A!! **can you believe that NONE of our friends have a video camera? this has been a massive hindrance to this party theme. we need to make better electronically equipped acquaintances.